When I get together to see friends I always bring a tasty treat. A gluten free pal and I were going to the movies but it was too hot to whip something up using the oven. 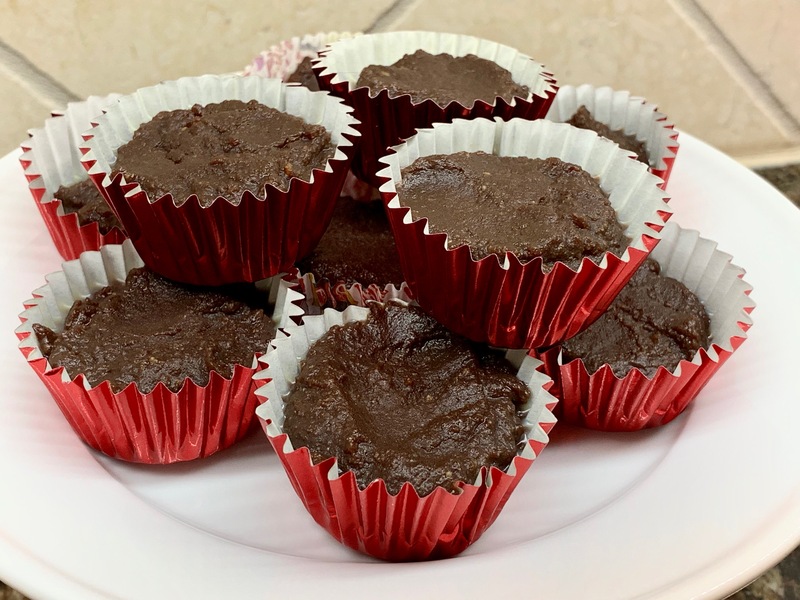 We both love dark chocolate, so I found a recipe that was no bake and gluten free and loaded with chocolate. If you take this with you when going out I do have a recommendation – have wet naps nearby. Movie theaters hate when you leave sticky chocolate handprints on their seats. This recipe was already vegan and didn’t require high altitude baking, so it was a snap to prepare. The only change I made was to add more berries and a variety of them. They are delicious superfoods so I figured it was a good idea. As a matter of fact, all of the ingredients below are superfoods. So, indulge away. To a heat-proof bowl over a pot of gently simmering water, add chocolate and almond butter. Stir occasionally for 2-3 minutes, until chocolate has melted. Remove from heat and stir in oats, almonds and dried berries. Drop by rounded teaspoonful onto a parchment-lined baking sheet. Place in refrigerator until set, 20-25 minutes. Makes 2 dozen. Lately I’ve been seeing recipes for chocolate bark everywhere. It’s no surprise because it’s tasty and makes a great gift. 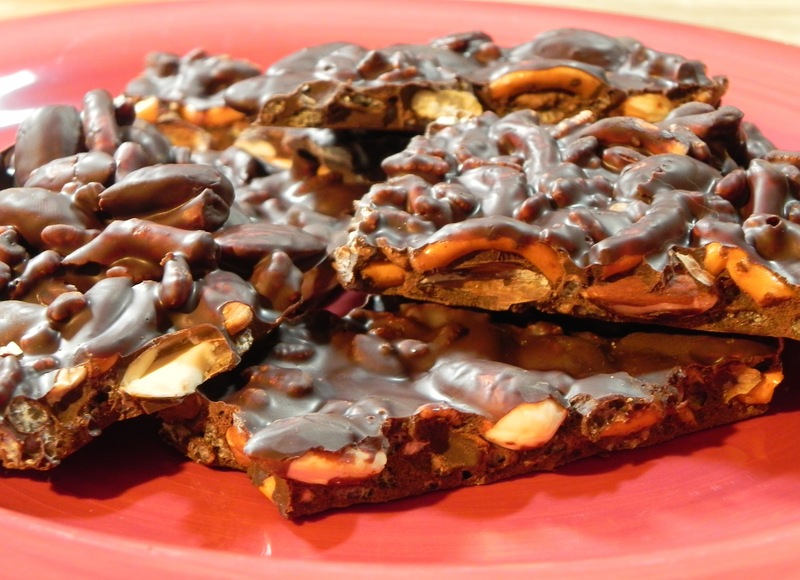 But I have also come to realize that bark should use tempered chocolate to have the right snap and be done properly. 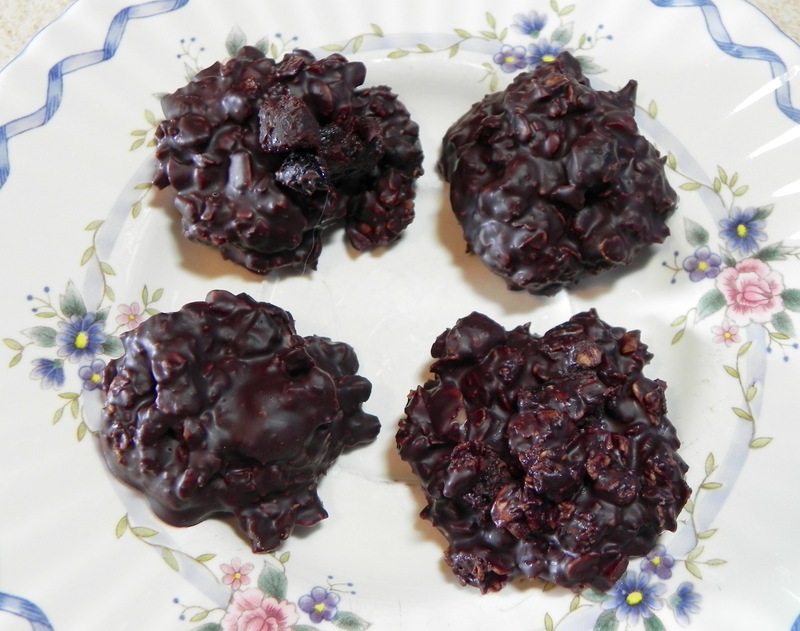 Not wanting to spend the time required to temper, I looked to haystacks which are treats with melted chocolate gluing them together. 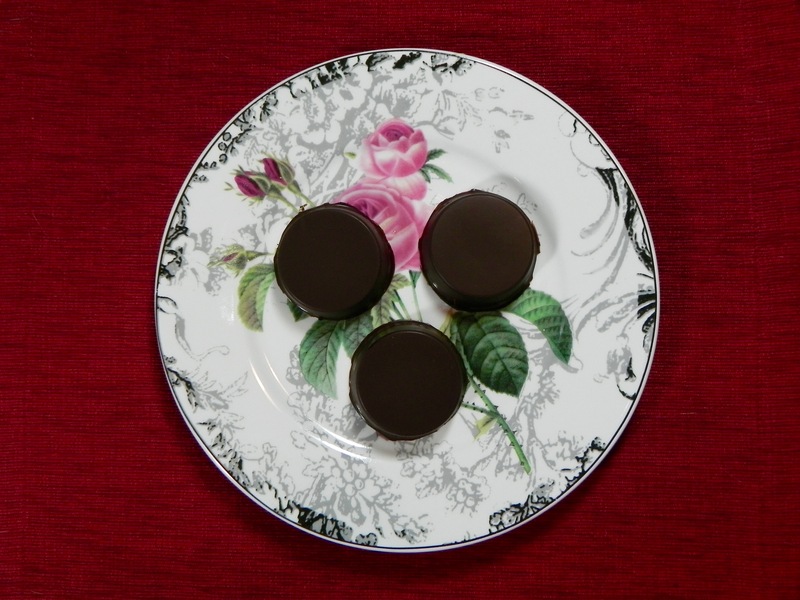 In today’s recipe I morphed those two delights to come up with my own version. Because no baking was involved, these require no altitude changes. And as long as you use dark chocolate with minimum additives, then they are already vegan. The alterations that I made were in the basic recipe. 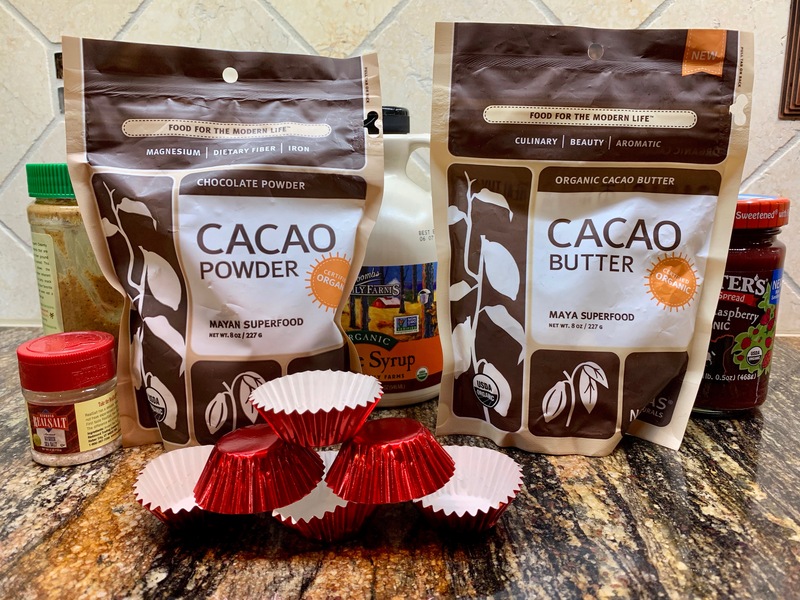 Feel free to do the same by picking and choosing what you coat the chocolate with, such as seeds, dried fruit, dried coconut pieces, and the like. I did find that the small amount of salt on the pretzels rounded out the flavor nicely. Line a baking sheet with parchment paper. In a bowl set over a pan of gently simmering water, heat chopped chocolate, stirring occasionally, until it is just melted. Put almonds, pretzels and cereal into a large bowl. Pour melted chocolate over mixture and stir to combine. Let cool a minute and then pour onto baking sheet. Place sheet in fridge for 30 minutes until bark hardens. Invert bark onto a work surface and break into pieces. 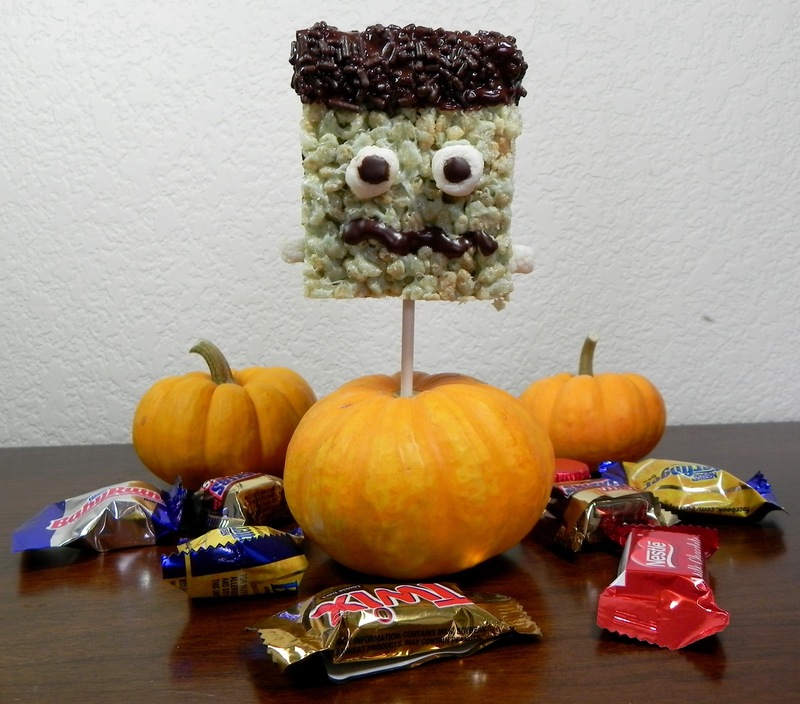 Halloween and Frankenstein go hand in hand for a good scare, so I found a scary Halloween Frankenstein treat. I know Halloween is tomorrow, but this recipe is fun and easy so there is still time. It’s based on a classic childhood delight making it even more of a holiday inspiration. Line an 8×8” pan with wax paper. In a saucepan, melt margarine and coconut oil on medium/low heat. Add marshmallows and melt, stirring often. Once melted, remove from heat and add food coloring until well combined. Quickly stir in cereal. Place in pan and pat down gently. Cool down for 10 minutes. Remove from pan using excess wax paper as handles. Gently remove wax paper. Cut into 6 rectangles. Place a lollipop stick into each treat. Coat tops of treats with melted chocolate and add chocolate sprinkles. Make eyes out of cut marshmallows with blobs of melted chocolate. Cut marshmallows for bolts. Secure eyes and bolts by gently pressing them into the head. Draw mouths with melted chocolate. Allow to set. Makes 6, unless you eat the scraps like I did and then it makes 5. It’s almost Halloween and that means … candy! I know it’s not baking but I had never successfully made candy before and I like a challenge. 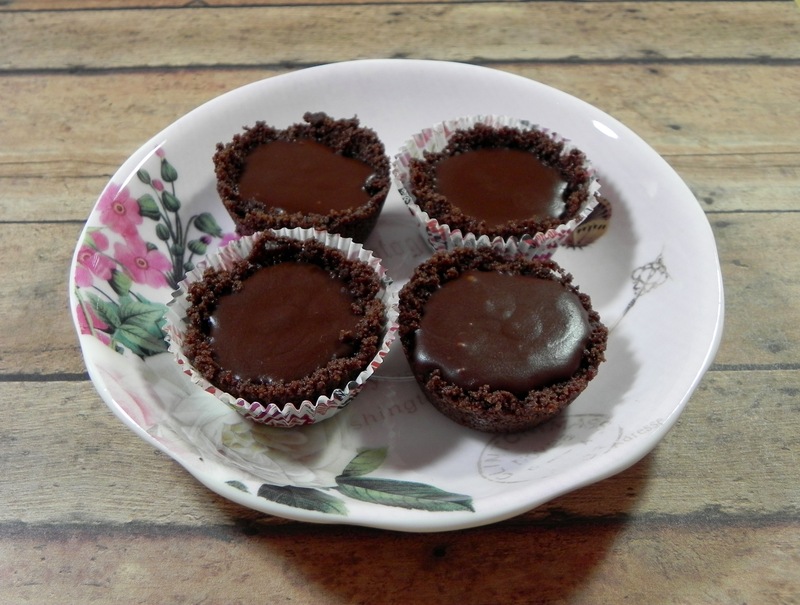 I found a recipe using simple, natural ingredients (read – no corn syrup) so I gave it a whirl. A few tips about candy making: 1) Set aside some time to make this and be patient. The process of heating the sugar mixture seems slow but it will happen. 2) Do not leave the pot unattended. I attempted candy making once years ago, but each time I did I got distracted and ruined it. My recent attempt at Halloween candy met with the phone ringing and then the door ringing seconds later. I was mere degrees from the correct temperature so I wisely ignored both. Shortly thereafter the honey smell became very strong and then instantly I hit the right temp. A few seconds later and it would have burned. 3) Wash the pot and utensils immediately after pouring the mixture into the molds. I washed the pot and thermometer quickly after pouring but I forgot the spoon for a few minutes. Getting the now-hard candy off of the spoon was more difficult than you would imagine. 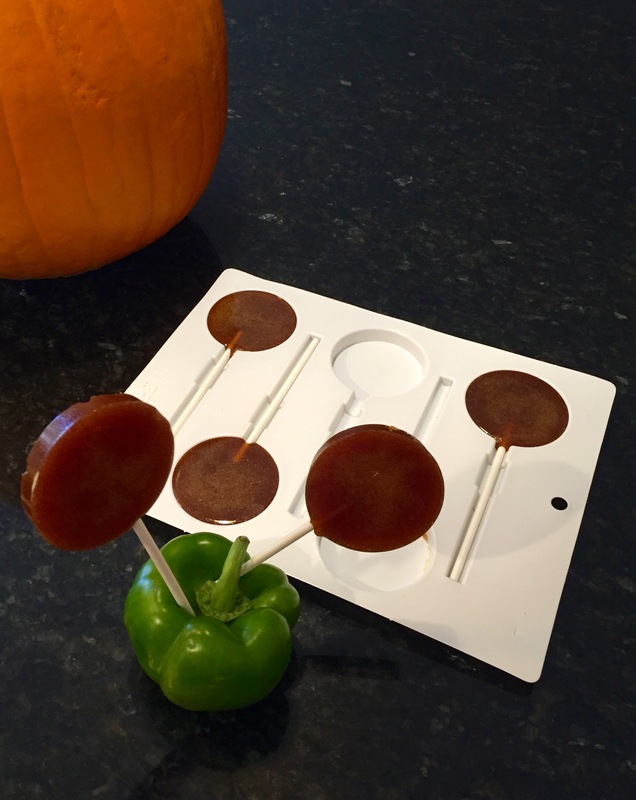 4) This recipe makes 20 round lollipops, but molds vary. I had a tray with parchment paper at the ready for pouring out the overage. Do not use the extra to overfill the molds. Overly full molds are a pain to unmold. In case you’re still wondering about cooking candy and not baking, I can let you know that my chocoholic taster was very enthused with the finished product in spite of the lack of chocolate. Use oil to grease lollipop molds. Drop a few pieces of candied ginger into each mold. Insert lollipop sticks and set aside. In a heavy-duty saucepan, combine sugar, agave and water. Insert candy thermometer, making sure not to touch bottom of pan. Cook at medium heat, stirring until ingredients are dissolved. Check pan occasionally to make sure mixture is not bubbling over. Once thermometer reaches 300F, remove from stove. Once bubbling subsides, add ginger essential oil. Stir well. Pour mixture carefully into molds, making sure sticks remain secure. Let cool before removing from molds. (If lollipops are difficult to remove, briefly run hot water over back of mold tray.) Place in plastic bags or plastic wrap.